Ok well this week is completely insane so I gotta keep this brief. 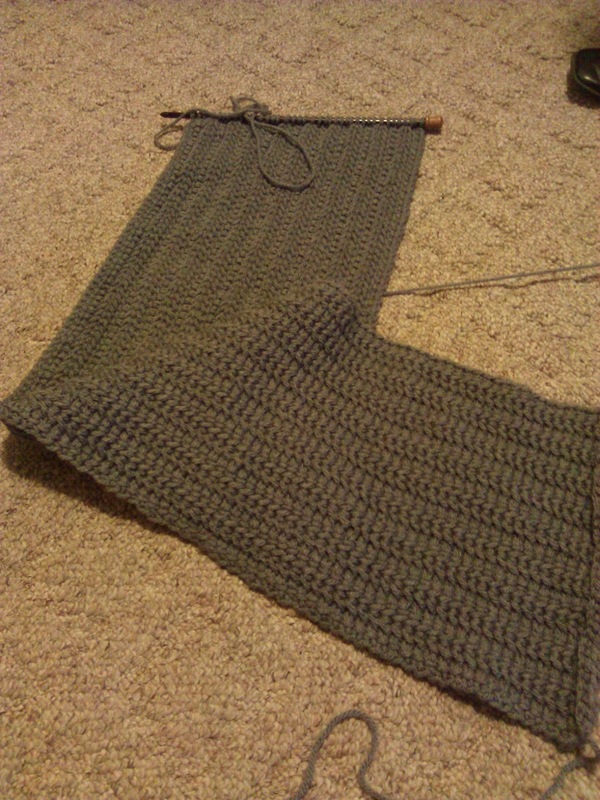 Scarf sweater is chugging along and I'm liking it. I'd say I'm about 75% done on this one! It's all smooshy and warm, too. Can't wait to wear it!! Waking up earlier is going not bad actually. After last weeks epic failures, it's improving. I was up at 5:55 today, which is actually about a half hour earlier than I was getting up. I'm gonna hold steady to this time for a few days before bumping it back anymore. Big progress that quick can lead to a quick failure if I don't let myself a adjust. That's about it for me. sorry to post and run, but I'm swamped!! 5:55...does that time even exist? I am not a morning person at all! I get my kiddos up at 6:30 in the AM and I am like a zombie!! I'm impressed at your 5:55! I can't wait to see your scarf sweater done! Looks like it is gonna be awesome!